What? You didn't know it was a thing either? I'm quickly discovering that there's a national day for just about everything, but in this case, I'm totally on-board with celebrating the summertime staple that is the s'more. And, of course, because I'm me, I had to throw my own touch on it and talk cupcakes -- S'mores cupcakes. Making these cupcakes is pretty straight-forward. Your key ingredients are going to be your go-to chocolate cake and chocolate buttercream recipes, marshmallow creme, graham crackers, and jumbo-sized marshmallows. Bake the cupcakes as normal, then core out the middle. There are lots of techniques for doing this, but my favorite is simply using a cupcake corer and pushing down the center of the cake to create a hole. 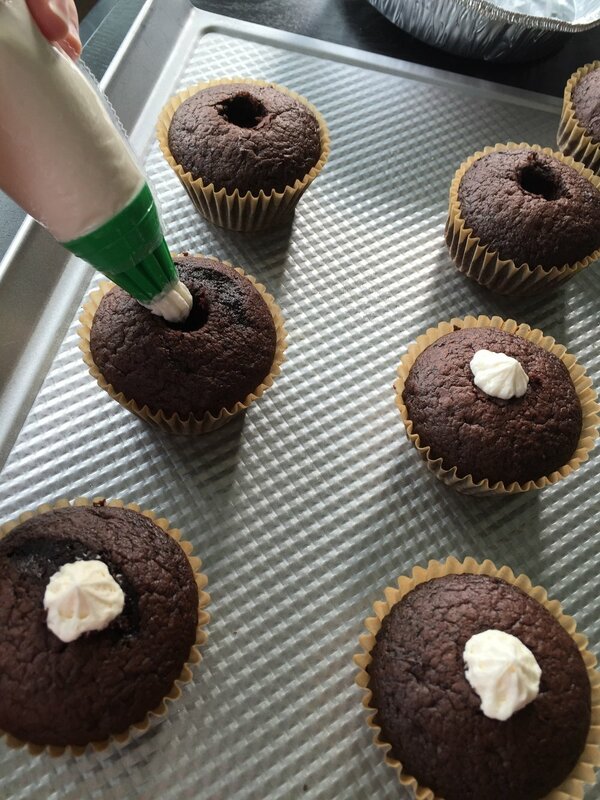 For me, it guarantees I'm not removing the entire cupcake center -- you still want cake on the bottom to ensure the filling doesn't ooze out once the wrapper is removed. I filled a disposable pastry bag full of marshmallow creme and just piped it into the cupcakes, being sure to fill it all the way to the top. I added my chocolate buttercream and sprinkled some crushed graham crackers on top. Now you're ready for the final step. Take your jumbo marshmallows and place on a cookie sheet. You're going to broil the marshmallows for a minute or so, just until they start to turn this golden brown. Be sure to watch the marshmallows (I had my oven light on the whole time); you can't set a timer for this one -- you need to actually monitor them so they don't burn. Gently place the roasted marshmallows on top of the cupcake and voila! 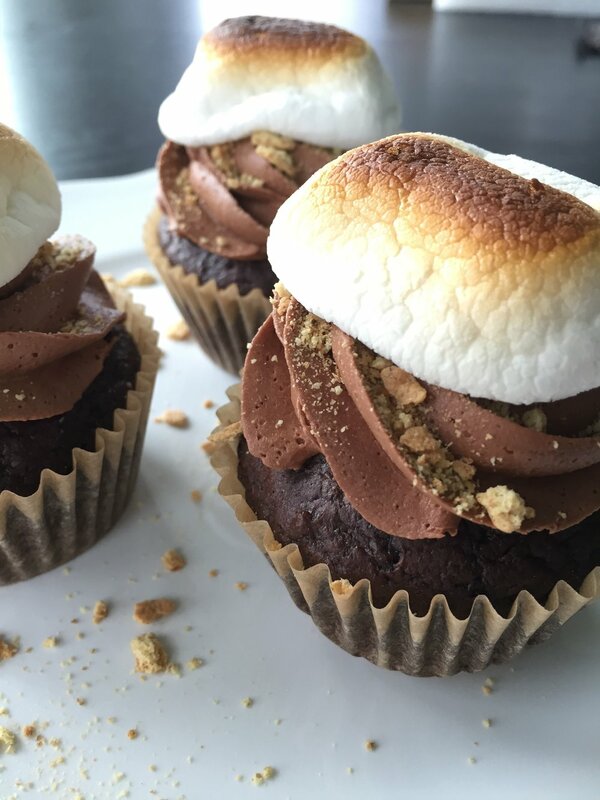 A gorgeous, super yummy cupcake alternative to standard s'mores. Enjoy!